Welcome! There have been visitors to this page since the new counter was started on 28th December, 1996. Maury has some good ideas about the possibility of a permanent memorial of some kind to River. You can read about them on the comments page. A forum for discussions on all matters related to River. If you would like to subscribe, contact Aaron. I am in college and need to sell my two River Phoenix autographs. One is of River in a suit from around 1989, and the second one is signed by River and Keanu Reeves from around the time of My Own Private Idaho. I bought these from a store called classic collectables. Included will be the original certificates of authenticity. This website is in no way liable. Highest offer will be accepted. Prices negotiable so please e-mail me. This site is listed in the 1997 Fan Link Directory by the Network For Entertainment Fans. Thanks! 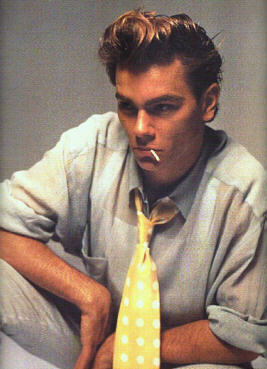 The River Phoenix Pages have been rated among the top 5% of all websites on the Internet by Point. Thankyou! Flix magazine in Japan has chosen The River Phoenix Pages as a "Flix Cool Site" in August 1996. Thanks! Copyright owners: copyright items on this site will be removed on request but I would prefer to have your permission to use them. The information is placed here for private use and for personal interest only. This is not a commercial or profit-making site. Maintained since 14th June, 1996 by Richard Ross - comments welcome!